EDMONTON (2015 FIBA Americas Women's Championship) - Cuba's team had to extend to overtime to defeat Argentina, 89-79, and qualify to play for the Gold Medal of the FIBA Americas Women’s Championship. • Turning Point: A conversion from Argentinian Celia Fiorotto, after capturing a rebound, tied the score at 73, at the end of regulation time. Once in the overtime, the Cubans imparted a 16-6 quarter, to take the win and a place in the Final. • Stats don’t lie: The statistics were even in more than one category, in percentage of shots, Cuba 46 - Argentina 46, from three-point land both teams were tied at 33 percent, in rebounds there were also tied at 33, but the only major difference was in the turnovers, where the Argentine had 18 and the Cubans 10. • Game Hero: Clenia Noblet was masterful for the Cubans, imparting her dominance in the paint and accumulating 29 points and 14 rebounds for a "double-double". 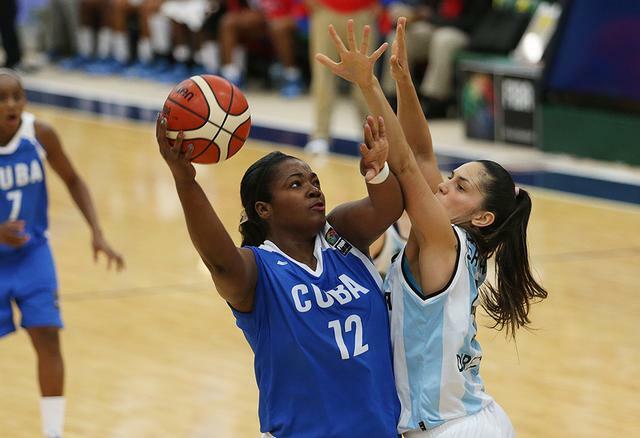 • The Bottom Line: Cuba will return to the game for the gold medal of the FIBA Americas Women’s Championship, where they will have the opportunity to repeat as champions of the continental tournament and also qualify for the 2016 Olympics Games.